I didn’t know I was a haxor… until now. I hope Andy won’t mind me posting this - since it’s just more publicity for his site! I browsed it in FireFox, IE and Opera and found considerable kinks that need to be ironed out. It was sluggish (especially when opening a feed) and did very wild things when I tried to move around the little windows. 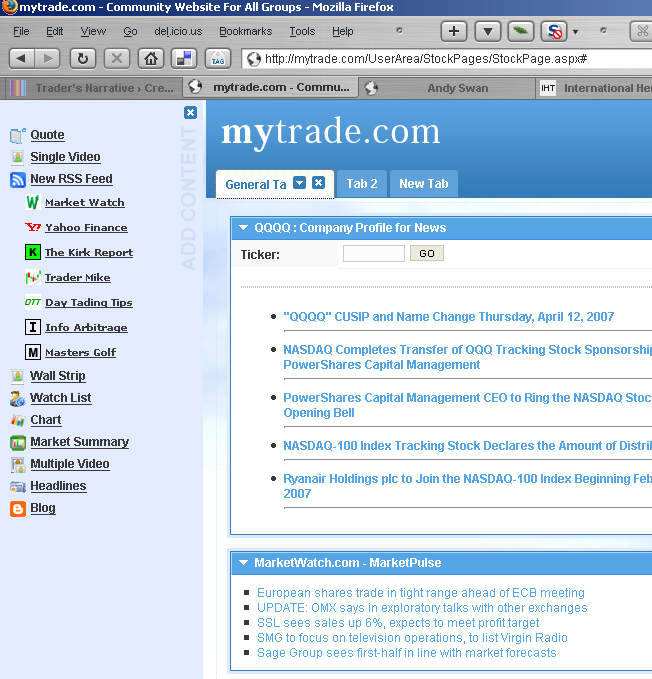 MyTrade.com is simply another Ajaxian content aggregator. Similar to sanebull.com and instantbull.com. Probably more like sanebull than instantbull (what is up with these names?!) Anyway, I don’t see the point of sites like these but then again, what do I know? Take it for a spin and give Andy some feedback. Hehe.. cute. Had a look at it, couldn’t tell how that’s any different from the myriad of other RSS based aggregation portals out there such as My Yahoo/Google Personalized/M$ Live/Netvibes etc. Freakin hilarious post! Not many bloggers have the stones to say what there thinking. Funny Hack. Agreed that it is similar to other things I’ve seen, but when I look past the bugs I like the interactive charts, and market blog/video aggregation. I’ll be disappointed if this is where it ends…but good start in a cool direction. Like you though…what do I know? Eyal, lol yeah it is a bit funny how easy it is to bypass the signup screen. I’m a total n00b and actually stumbled on this a while back. Mike, yeah, I just scratch my head at the value added they are offering. It seems like a ‘me-too’ service. Thanks for the feedback. I agree that it has some major kinks..that’s why we haven’t started beta yet…just getting a good group together for it first. As to the “me-too” accusations…well I can see where you are coming from, but the vision goes well beyond the features in place now..and beyond the page you are seeing and I stand by the value that a cusomizable “start page” for stocks will provide. We are putting it out there before its ready or even close to complete for a reason.